Dorner is exhibiting its new 3200 Series Conveyor with ARB™ Technology, along with its SmartFlex® and Precision Move platforms, in Booth No. 1059 at Automate 2017, April 3-6 in Chicago’s McCormick Place. Dorner manufactures packaged and custom conveyor solutions to meet the industrial, packaging and sanitary conveyor automation needs for a variety of industries. Dorner’s SmartFlex Pallet System conveyor is ideal product routing, control and inspection in assembly automation applications. SmartFlex components, sold as completed assemblies or as kits, offer users layout flexibility and the ability implement conveyor system design changes easily. Components include merge and divert modules, lift and locate stations, cushioned pallet stops and a unique pin tracking system to guide pallets through 90° turns, all of which attach directly to the conveyor frame, without the need for modifications. Customers can purchase SmartFlex mechanical components separately or as part of a complete electrical solution. Also on display at Automate 2017 is Dorner’s Precision Move Pallet System platform, which is designed to provide accurate positioning and routing of parts for assembly, robotic and inspection applications. The modular, dual belt Precision Move Pallet System offers lift and locate, lift and rotate, and lift and transfer modules, as well as quick belt changeovers and a unique pin tracking system for cost-effective pallet traffic management. 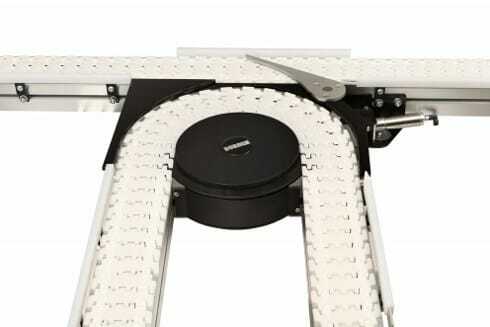 Joining these conveyors is Dorner’s 3200 Series Conveyor with Intralox Activated Roller Belt™ (ARB) Technology. It’s is ideal for moving boxes and packages in merging, diverting and aligning applications. ARB Technology uses low and high friction angled rollers within the belt to help smoothly guide and align items of all sizes. This conveyor technology minimizes floor space, increases system reliability, eliminates costly system controls, provides a safer work environment, and can handle products as small as 6” x 6”. Finally, Dorner’s 3200 Precision Move Conveyor features a servo motor capable of up to 100 indexes per minute with ±0.02” index repeatability. Fast and accurate belt movement provides precision and repeatability, and positive drive no-slip belting provides worry-free belt tracking. To see how these conveyor platforms can help your material handling applications, make plans to visit Dorner at booth 1059 at Automate 2017.